Reality celebrity Heidi Montag is considered to be obsessed with plastic surgeries, this might actually be the only logical reason to why she went under 10 PLASTIC SURGERIES in one day, or just that she is obsessed with perfection. The Heidi Montag cosmetic surgery rumors have been confirmed and they’re worse than most fans would ever hope for them to be. Montag, who is known best for her starring role on the MTV reality series The Hills is a TV personality and singer that was born in 1986. Extremely young for plastic surgery, even by the Hollywood standards, Montag first achieved her celebrity in the year 2006, but she appeared on other shows and productions till 2010, beginning work on her debut album in 2009. It was also in the year 2009 that Montag began the process that would turn her into a plastic surgery celebrity, and all for the wrong reasons as the personality herself would later admit to quite freely once she recovered and realized she’d have to live with her bad plastic surgery decisions. 1.8 Why Did Heidi Get Surgery? 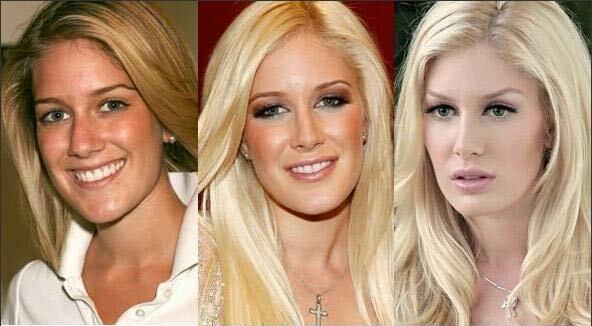 1.12 What Were Heidi Montag’s 10 Plastic Surgeries? Montag’s case is somewhat unique among celebrity plastic surgery stories. Unlike Jennifer Lopez’ rumors, Audrina Patridge or the Nikki Cox surgery gossip that still fills tabloid pages, Montag has fully admitted to the public, several times in fact, that she’s gone under the knife. If you look at the above before and after picture you can hardly recognize her, she is now said to be princess of cosmetic procedures. And not only once, but no less than 10 different times for 10 separate plastic surgery procedures to alter different parts of herself, which turns speculation into something much more concrete. And not only has she verbally admitted that she’s had cosmetic procedures done, but Heidi took it a step further. It was in 2010, roughly one year after her plastic surgery debacle had drawn to a close and she’d recovered as fully as she could, that Heidi Montag gave an interview to and underwent a photo shoot with Life & Style Magazine. In the interview Montag revealed that in November 2009 she underwent all 10 procedures, many of which left her with horrible results and even worse scars as testament to her surgical decisions and pursuit of perfection. and a number of other unpleasant and unsightly results such as uneven and scarred breasts resulted from the poor attempts at further cosmetic improvement. “Parts of my body definitely look worse than they did pre-surgery,” Montag told Life & Style in the first really candid interview she underwent specifically about her procedure and the results of it. “This is not what I signed up for.” Montag also added. The Heidi Montag cosmetic surgery rumors have been confirmed and they’re worse than most fans would ever hope for them to be. Before we carry on, this video contains audio footage of Heidi talking to her mother about her various plastic surgeries. It’s quiet clear what her Mom’s view is. But it seems that Heidi still doesn’t need much convincing that she might need even more surgery. Why Did Heidi Get Surgery? According to Montag’s interview with Life & Style Magazine the young and rising star was seeking perfection, and she decided she needed to get cosmetic surgery done on her already attractive physique in order to achieve it. Given that some of Hollywood’s greatest and most iconic bodies and faces, including that of the famed starlet Marilyn Monroe, were created with the aid of a plastic surgeon’s scalpel it’s no wonder that the idea that you need plastic surgery to be beautiful and famous in tinsel town has managed to survive in the halls of the Hollywood elite. And Montag clearly fell prey to the pressure to be perfect, even at such a young age when her body was still firm, fit and changing naturally. The ironic part of going through so much surgery, and in doing so much of it so close together, was that rather than eliminating Montag’s flaws it actually back-fired and had the exact opposite effect that Montag had been hoping it would have. Powerful words, and heartfelt ones from someone that was transformed so horribly by a doctor that was supposed to make her more beautiful. According to the interview the whole process was a horrible endeavor for Montag, and possibly the worst decisions she’d ever made. In the personality’s interview she said that she would have nightmares about her face, and explained how her husband had to help her with her clothes just so that she could do something as simple as going to the bathroom. In January 2010, Heidi Montag went under the knife and had no less than 10 different celebrity plastic surgeries all at the same time. She later reported that she nearly died after the operation and in 2011, openly regretted she went through it. Below, courtesy of the Huffington Post, you can see a list of all 10 Heidi Montag plastic surgery procedures together with a picture from November 20, 2009 which clearly shows her before and after the surgeries. Without doubt, it is her face where the most difference is noticeable. What Were Heidi Montag’s 10 Plastic Surgeries? Heidi might be disappointed to learn that does not hold the record for the most plastic surgeries on a single individual. That title or ‘accolade’, if it can be titled as such, belongs to Cindy ‘Barbie’ Jackson who is the official Guiness Book of Records holder. Next Next post: Anne Hathaway : All Natural?